As 76084 approaches her main line debut, details of which are scant at present, a discussion has begun on how many coaches can a Class 4 locomotive haul. In the wider main line field there have been instances of late where even large Class 7 locos have come to grief and stalled due to combinations of circumstances. So it is important to establish 76084’s load capabilities. And so following the revelation that an article about 76084 appeared in a 2012 edition of Back Track magazine as discussed on the main website here, I set to to find myself a copy. I am something of a black hole when it comes to anything 76084 just swallowing up any titbits of information and always wanting to have the original magazine in my collection if 76084 is mentioned certainly if that mention is about British Railways days. The article in question was actually revisited in a recent edition of the Keithley and Worth Valley Railway’s house magazine ‘Push & Pull’ which brought it to the attention of several 76084 Loco Co Ltd shareholders who independently let me know about it. The author of the KWVR article also a 76084 shareholder sent me the text which allowed me to put the story on the main website. So what do you think our example of a ‘Pocket Rocket’ can haul comfortably? 6 or 7 perhaps. It’s my personal opinion that again a certain set of circumstances came together in 1957 that really put 76084 to the test but was it? The BR Standard 4 2-6-0s were new to the area in 1957. Could it be that enquiring minds, possibly from the local Operating Department, wanted to see just what such a loco could achieve prior to accepting a batch into their fleet? Going back to the original article I searched hard for a copy of the relevant Back Track and eventually found one on eBay. Having paid for it the vender then informed me he hadn’t kept his records up to date and the particular issue was no longer in stock. But the vender was one of the good sort and promised to source one for me and he DID. Ironically from Ingrow on the KWVR. Now I’m happy on two counts. I know exactly what a BR Standard 4 can achieve and I’ve got the article in my collection as a record. If you find anything about 76084 out there please do let me know about it – I do love these quests. I moved house 4 years ago and had to make some sacrifices when it came to my collection of books, especially those to do with railways. It went further – I had to promise not to buy any more as our new home is short on storage and bookshelves. I’ve also known for some time that railway books in particular do not retain their value as the secondhand market for such items is almost none existent. So today we visited a large ‘antiques centre’ and I was overwhelmed with the number of railway books I found without really looking hard. Usually at such places I race ahead whilst my dear wife devours each stall. Today it was the opposite. I started looking through collections of photographs which really is time consuming in the hope of seeing anything that fits my criteria. I came to one stall and a book called ‘BRITISH RAILWAYS Engine Sheds – London Midland Matters’ by Chris Hawkins, John Hooper and George Reeve which only ticks my third box took my fancy. I flicked through the pages as you do and thought this could be interesting so carried it round for the next 2 plus hours (lunch was in there somewhere). I found a limited edition OO gauge bus for my 1960’s steam/diesel crossover layout and was content to leave the establishment with 2 purchases. As I drank the obligatory brew on arriving home I thumbed through the book. Being mildly dyslexic I had a little difficulty with the Times New Roman typeface (a well known fact which also goes to explain why this blog is produced in something else). I had no difficulty, however when arriving at page 85 on recognising the Midland Coaling Stage of Hellified Shed nor the locomotive posing by it. To my complete surprise and delight it was 76084. The photograph was taken by a T J Edgington in 1961. Interestingly, 76084 has only 2 Overhead Wires Warning flashes on her front steps. Going back to my criteria for railway book buying two boxes are now ticked and in the words of the prophet Meatloaf ‘2 out of 3 ain’t bad’. This new book will be added to my collection of all things 76084/Lower Darwen. I’ve yet to put the bus on my layout – that will have to wait till another time. We have come across an image from Colour Rail taken from a 35mm slide of a Standard 4 Mogul pulling 2 coaches on Shap. The title on the slide is ‘76084 on Shap’ but is it really? Look closely at the smokebox number plate. What do you think the last 2 digits are? It could be a shedmate of ’84. And do you know the working from the designation on the smokebox? If anyone can throw any light on this or even help us ‘join the dots’ we would very much appreciate it. As 76084 prepares to go main line there is some debate about loads she will be able to haul. We know she (almost) managed a 14 coach holiday train back in the day. The real pulling capacity of a Standard 4 Mogul has to be much less than that but certainly more than 2. Then again we are talking here of going over Shap. Thoughts on a postcard or below please. PS Our thanks to Colour Rail for allowing us to use this image in this way. Whilst 76084 received some attention during her stay at Woodham Brothers’ Barry Scrapyard in the form of a coating of red lead not so her Mark 2A tender. Indeed, her tender provides an interesting view into who had ideas about preserving either the tender itself or the loco and tender together. I’ve just come across some interesting images new to me taken at Barry. Most of them are familiar Driver’s side front three-quarter or from the front showing the other locos she was stored with but one photo shows the Driver’s side rear three-quarter view with the tender nearest the camera and showing loads of daubed on messages about (future) ownership. The image I’m referring to is contained in an album part of John Kendrick’s Photo Gallery which is, as you can see, online. Let me take you directly to the image here. Study the various messages on the side of 76084’s tender (and it is 76084 evidenced by the now pink coat of red lead). How many different railways can you see written on the tender? As an aside to the main topic of this article you can clearly see the ‘Horwich Lining‘ technique applied to tenders painted there which has been faithfully repeated during 76084’s restoration. That is, the rear vertical lining comes down short of the tank end in line with the step on the tank shoulder so that the early BR Crest can be applied over a single horizontal line of rivet heads and not a cross of them. HRPS stands for the Hallamshire Railway Preservation Society who reserved 76084 in 1974 and spent time painting the loco in undercoat. A move that ultimately came to naught as the Society’s Treasurer used their funds to buy a Brake Van instead!! Bluebell Railway is plain to see dated 6 December 1979. This is interesting because the other cabside has E.L.R on it before it was undercoated in 1974 and the 3 September 1977 edition of ‘The Barry List‘ has her reserved for the East Lancashire Locomotive Society. The Bluebell Railway also ‘bought’ BR 2MT 78059 a few days later – on 12 December 1979 as shown in this image. This number appears in our image towards the rear of the tender. Perhaps the master plan was the 2MT + this tender as a pair. Who knows? 78059 did make it to the Bluebell but without this tender and now forms the basis from which a BR Standard 2MT 2-6-2 tank 84030 will be built. NYMR is there twice! One of them has SOLD with the date 29 January 1980 next to it. How many times did this tender get SOLD? As with so many initiatives concerning Barry locos none of these came to fruition and Pip Rollin stepped in in late 1982 to buy both loco and tender and as they say the rest is history. The 76084 Locomotive Company Limited has just passed its 18th birthday and is looking forward to seeing her perform on the BIG railway in the no-too-distant future. http://www.standard4.com/develop/wp-content/uploads/2017/05/Logo_Master_Pillar_web.png 0 0 Eric Bond http://www.standard4.com/develop/wp-content/uploads/2017/05/Logo_Master_Pillar_web.png Eric Bond2015-09-13 17:25:002019-01-15 18:59:49Tender Behind? On the Platform at Loughborough Central at last year’s Great Central Railway Autumn Steam Gala I was introduced to an enthusiast who is the proud owner of an image of 76084 at Fleetwood MPD (24F later 10C). He said he would sent me a copy. Because of all the things going on during that fabulous month of October on the GCR, the memory of the conversation faded (not to mention the advancement of age and more senior moments than I care to admit to). So imagine my surprise and delight when Alan Smalley got in touch with me and did indeed send me the said image reproduced here for your own perusal. Here is 76084 right at the very back of the Fleetwood Maintenance Shed and in bits. Never mind the poser in front of the engine. Have a look around the various parts of the image. She bears not only the original 24D Lower Darwen shedplate but also her ‘SC’ (self-cleaning) designation plate. The year is 1958. What is unusual is that both piston and valve covers are off suggesting both are being inspected. It is also interesting to note that the tender has been uncoupled too. Valve inspections were and are more frequent than piston inspections then taking place after 10 to 15,000 miles whilst piston inspections were normally at a frequency of around 20 to 25,000 miles running if I remember rightly. In 1957 from new 76084 ran 24,637 miles and was out of service for repairs for 21 days. In 1958 she ran a total of 27,353 miles but was out of service for 49 days for repairs. Could the work going on here be some of those 49 days? 76084 transferred to Lancaster Green Ayre (24J) on 4 October 1958. Could this work be being performed immediately prior to the transfer so that the Lancaster loco crews would have an engine in fair fettle to try out or could it be that they’d run her a few times and considered a full valves and pistons inspection was necessary? If anyone can shed (pun intended) any further light on this we’d appreciate it. Whatever the reason for the dual inspection it does make for a very interesting photo and speculation as to why. Thanks, Alan for taking the time and sharing this with 76084 Loco. Co. Ltd.
Did 76084 ever run with a shed code plate other than 24D or 10H for Lower Darwen? When new 76084 carried 24D ‘SC’. I have seen ‘SC’ referred to as the ‘the Scottish connection’ in comments on one photo showing 2 locos with ‘SC’ plates. On Guard’s whistles for the Scottish Region they were stamped ‘BR (Sc)’ so I can see some confusion coming into play but ‘SC’ under a shedplate meant self-cleaning and was there in the early days of the technology to inform cleaners on shed not to bother emptying the smokebox of fly-ash as there wouldn’t be any there. Back to our main theme. 76084 went to two other North West sheds between early October 1958 and late March 1959 (totalling around 6 months) these being Lancaster Green Ayre and Skipton. We are about to share with you a photo of 76084 at Fleetwood which is far from being just another photo of a loco on shed and as such deserves to be the subject of another blog article. 76084 still carries 24D ‘SC’ in this 1958 photo. Moving on several years in 1966 when now at Sutton Oak, St. Helens, all her sisters from that shed had lost their 8G ‘plates but 76084 still carried 10H. When did she lose the ‘SC’? Could it have been when at Lancaster (about 2 months total in 2 sessions) or Skipton (one 4 month stretch)? Did she ever run with 24J or 24G respectively? Or did the BR Midland Region management of the day plan not to take off the 24D ‘plate as the periods at either shed were short or experimental? What we do know is that eventually she wore 8G chalked or hand-painted on the smokebox before the short period at Wigan Springs Branch but never an 8G ‘plate as they had all gone missing!! We launched the ‘Go Mainline‘ Appeal on the day 76084 returned to revenue earning service on the North Norfolk Railway. That was in July 2013. We are pleased to announce that we have raised sufficient funds to install 2 of the 3 technologies needed. A Train Protection and Warning System (TPWS) is a must on today’s modern national railway system. TPWS has been around since rollout in 2003 and is attributed with significantly improving railway operational safety since its full roll-out in 2003. On-Board Train Monitoring and Recording (OTMR) provides a complete record of each state change of all monitored controls. Data recording takes place in a crash survivable memory module equivalent to a plane’s ‘Black Box’, with journeys in excess of 24 hours duration easily accommodated. The data can is utilised for safety monitoring procedures and the analysis of operational performance. Our last big push is to fund GSM-R – Global System for Mobile Communications-Railway which is an international wireless communications standard for railway communication and applications. It is used for communication between train and railway regulation control centres. The system can perform at speed without any communication loss. The train maintains a modem connection to the control centre at all times operating with higher priority than normal users. If the modem connection is lost, the train will automatically stop. So. Please do have a look at our ‘Go Mainline‘ Appeal page and see if there is something to sponsor that takes your fancy. Alternatively, you can donate, buy merchandise or even buy shares (joining the 76084 family). let’s get our ‘Pocket Rocket’ on the mainline in 2015. Ever since 76084 returned to steam on the North Norfolk Railway one particular shareholder has had a longing to take a party of friends and family for a driver experience day on 76084. On Wednesday, 25 March 2015 Jim Higman’s wish came true. The ‘party of friends and family’ in the end came down to Jim and his son. The upside of the small party was that they both got to drive 76084 for 2 round trips and fire her for 2 more. The photos show Jim next to 76084 at Sheringham ahead of a day’s pleasant graft on the footplate and below Higman Jnr (sorry I don’t know your first name) literally in the Driving Seat with a hand on the Regulator receiving instruction whilst passing through the Norfolk countryside. The observant amongst you will notice two handles for sounding either of the whistles that 76084 is currently fitted with. 76084 went on to provide motive power for charters on the following Thursday and Friday too. 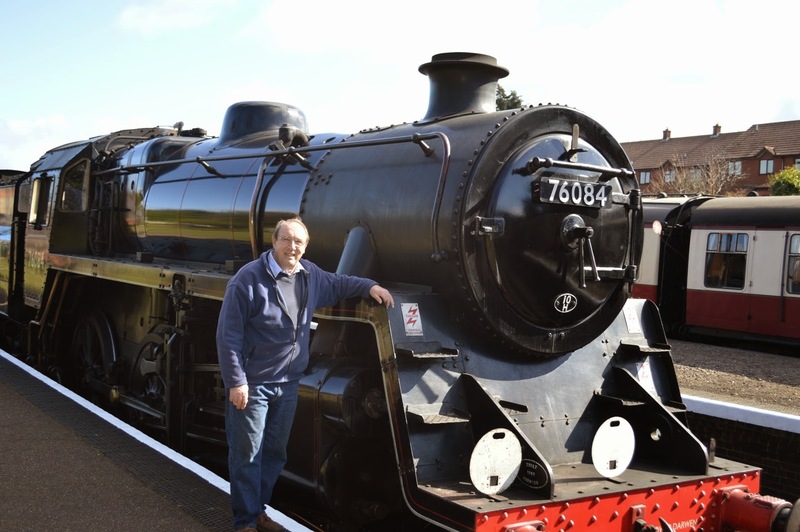 Great weather, great railway, great loco – is that all the boxes ticked? 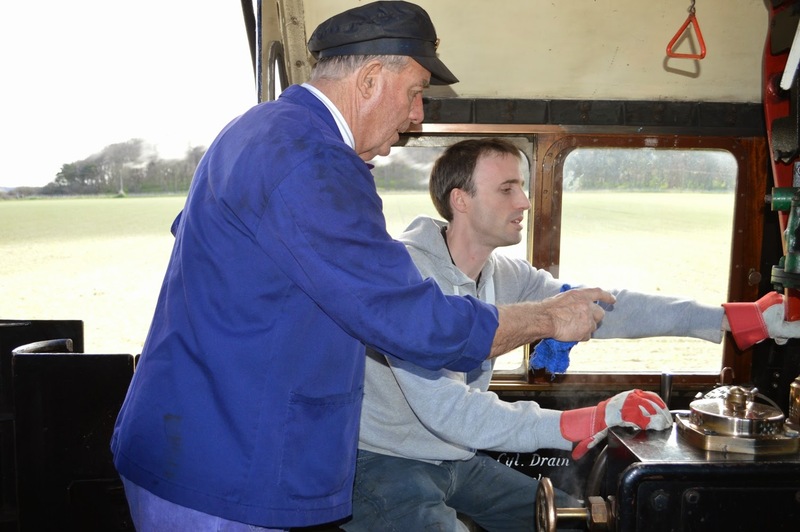 Driver Experiences at the North Norfolk Railway are popular the next available places being in late October but we cannot guarantee that it will be on 76084. Over the past few years we have been compiling a 76084 Sightings List on our website. Just recently we have been able to add a significant number of new ones and for this we are indebted to shareholder Peter Eastham and his friend Bernard Bond (no relation to yours truly). Bernard resided in Great Harwood close to the Goods Yard that sadly no longer exists there and is something of an expert on the ‘Padiham Loop’. He has provided us with a few sightings in 1960 through Peter who has added his own to the list also. Peter has lived next to the Blackburn-Hellifield line for most of his life and regularly saw 76084 pass by on different duties bu primarily as the ‘Whalley Banker’. As the line approaches Blackburn through the village of Langho there is a significant gradient and banking locos were provided to assist heavily loaded trains up and over this incline. From Peter’s observations 76084 was a regular performer on this duty. So regular that Peter often neglected to record seeing her which is understandable. Having put Bernard’s and Peter’s sightings into our list we have a total of 88 sightings. But have a look at this chart which shows there are some significant gaps in her history. So 88 sightings is good but there must be more out there. Did you see 76084 between April 1957 and December 1967? If you did we’d love to hear from you. Please don’t be shy!! We have few sightings of 76084 between May 1963 and May 1964. See our Sightings page for our complete record of reported sightings. 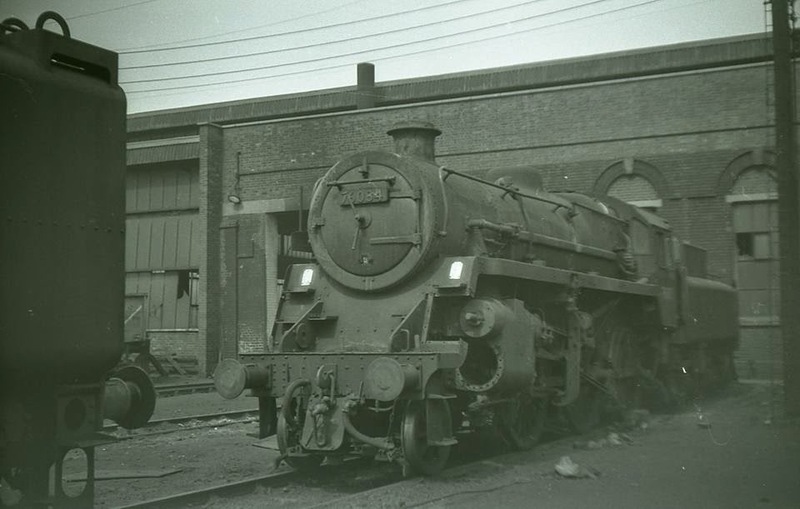 You will see that 76084 was seen on Saltley, Birmingham (Shed Code 21A) outside Number 3 Engine Shed by Gordon Hopkinson in May 1964 as shown below. 76084’s Record Card has a note that she became the responsibility of Swindon Works in December 1963. At this time Horwich Works was running down its steam locomotive overhaul work and 8F 2-8-0 48756 was the last being despatched after overhaul on 4 May 1964. It seems logical that Swindon became responsible for members of the Standard 4 2-6-0 class since they built 2 Standard classes there but not this one. Looking at Gordon’s photograph the centre driving wheel has the eccentric re-fitted as if ‘in transit’, probably with the connecting rod, piston and cylinder cover stowed in the cab or tender. One possible reason she is on Saltley is that she was on her way to Swindon from Lower Darwen for repair. The huge gap in sightings of 76084 before this sighting suggest something was seriously wrong with her in this period. Did British Railways management change their mind about Swindon and send 76084 up to Cowlairs instead for the repairs to be carried out? Cowlairs Works was noted for painting the name of the home shed on a loco’s bufferbeam when it went through the works. Peter Winstanley, a 76084 supporter was puzzled by this on 76084, not being aware that she visited Cowlairs. However, Peter was going through the Railway Correspondence and Travel Society’s (RCTS) book ‘Standard Steam Locomotives Volume 5’ recently after some other information when he came across more works visits data not covered in the earlier Volume 2 in the series. Volume 5 corrects any mistakes in Volumes 1 to 4 and details any additional information gathered about the Std Classes since Vols 1 to 4 were published. So thanks to Peter’s eagle eye we now have a much more comprehensive works visits record for 76084. During her first visit to Cowlairs the front bufferbeam must have been adorned with her home shed ‘LOWER DARWEN’. By 76084’s second visit in May 1965 she was a Sutton Oak engine but was only there too short a time receiving only a Light Casual repair to have that Depot’s name stencilled onto the bufferbeam. Peter has provided us with a photograph (see previous blog articles) taken in July 1966 with the ‘LOWER DARWEN’ stencilling still in existence. We are happy to perpetuate this (and her 3 front steps Overhead Wires warning flashes) on 76084 in preservation. Thank you, Peter for providing us with previously unknown facts about 76084.